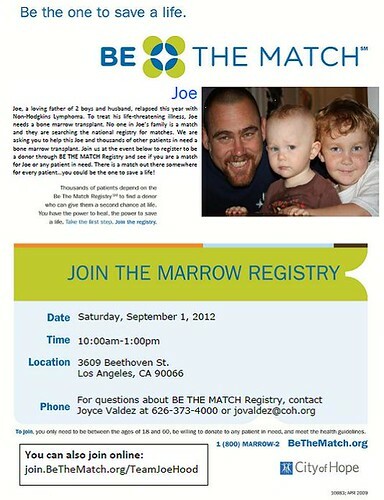 Bone Marrow Drive Tomorrow! - Yo! Venice! Home Neighboring Communities Bone Marrow Drive Tomorrow! My family grew up in Venice. My husband and I and our two young boys now reside in Culver City. We are a local family. I am reaching out to spread the word about a bone marrow drive this Saturday to hopefully find a match for my 38 yo hubby in his battle against lymphoma. It’s a quick easy cheek swab to register. My 38yo husband had a bone marrow transplant with his own stem cells last October at City of Hope. We truly believed he had put the cancer behind him and that we could move past this and focus on our two young boys. Unfortunately two weeks ago we found out he has relapsed. Last week we found out his only sibling is not a match. Now we must find a donor. I am putting my heart out there. I need him. Our boys need him. If you are willing and able, we have two upcoming swab parties. It is a simple cheek swab to register for BeTheMatch.org. And if you are not able to register please consider helping me spread the word. We just need one match. I could not have gotten through the last year and half without this amazing community that has surrounded us. Please join us if you can and spread the word. We can be found on Facebook at Team Joe Hood with upated information. I can also be reached at 310-490-8289 call/text. Happy to speak with anyone and everyone. A huge thank your for your love and support. Thank you from the bottom of my heart for everything.